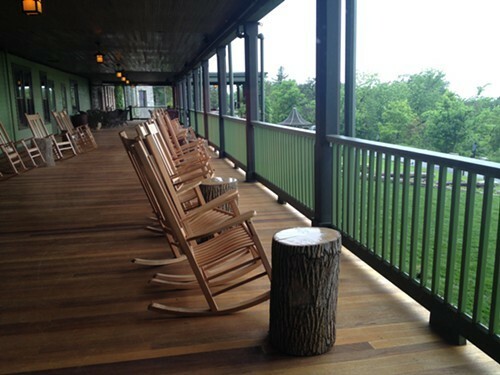 A while ago Mohonk Mountain House invited me to try a spa service, lunch, and tour the Mohonk Mountain House, and on a dreary June Wednesday I finally took them up on their offer. Getting to Mohonk is an easy drive from Woodstock. I avoided the thruway (87), and enjoyed the scenic route via 209 South and Route 213. The road that leads to (Mountain Rest Road)Mohonk Mountain House is a little hilly, but my old Ford Focus made it without a problem. There is self-parking (free) or valet parking for $5. I drove straight up to valet parking, which is at the doorstep of the resort where I met Katie Martello, assistant director of marketing, who walked with me to the spa. The spa is the newest amenity at resort. It was added on in 2004. There was a bit of activity at the spa, but as it was Wednesday, there was no competition for the steam or sauna rooms. I had a little time before my 10 am massage so I went into the Eucalyptus steam room, and relaxed in stately Women’s Veranda which has really comfortable lounge chairs. I noticed that they don’t have any magazines there, and as iPhones and cell phones are also banned in the spa, I was left unplugged with nothing to read. It was actually very nice to just relax with my fancy tea and stare off into the forrest for ten minutes. Soon massage therapist, Shiloh came out to greet me, and lead me to the treatment room for my Breathe Deep & Be Well Massage. I chose this massage because my tension creeps up in my neck, shoulders, and chest so I thought this would be extra relaxing, and it was! I started off resting on my stomach, and inhaling the aroma of Eucalyptus, while she massaged my back and arms. She told me that there would be stretching too. Shiloh used Naturopathica peppermint body cream on my hands, which felt wonderful. The 50 minutes went by very fast, and before I could drift away to sleep, it was over. After the massage, Shiloh presented me with a light snack of green grapes and cold Wild Cherry Apple cold drink, and walked me back to the Women’s Veranda. (There is also a co-ed Veranda, by the way). I brought my bathing suit along so I went downstairs to test out the indoor swimming pool. There were a few women already swimming laps, and young couples lounging in the chairs. The pool is heated, but not super hot so I enjoyed swimming there for 15 minutes, admiring the high wooden beams on the ceiling as back stroked. (If you are not a hotel guest, and just get a spa service for the day, you have the option of purchasing a day pass for the pool and fitness center for an additional $25. This is only possible on midweek days, non-holidays, and off-peak times). Despite the rain, I really wanted to check out the heated outdoor mineral pool. It is about the size of a large jacuzzi, and set right outside the spa among the trees. There were a few women soaking in it, but I just went in for a few minutes. It was lovely, but it started to pour so I went back in to take a shower and get ready for the hotel tour. Made a few wrong turns in the hotel. (It is easy to get lost here if you don’t know your way around). I made it to the front desk, and met marketing manager Emily McNamara, who showed me around the hotel to the conference area, Lake Lounge, a Classic room, a Victorian Room, a Lake View suite which includes 2 bathrooms, and finally the prestigious two story Mountain View Suite. Rooms start at $299, based on double occupancy (not including taxes and gratuity which are added on so you don’t worry about tipping at all during your stay). The rates include breakfast, lunch, dinner, and Afternoon Tea and Cookies, and most resort activities (access to hiking trails, yoga, paddle-boarding, tennis, etc). 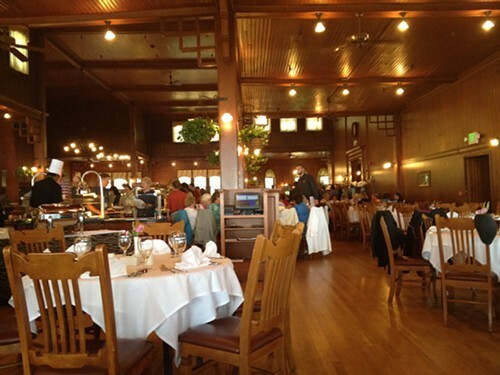 After the tour, it was time to enjoy the weekday buffet lunch in the elegant Mohonk Dining Room. Last time I dined here was for my husband’s birthday dinner four years ago. I love buffets, and Mohonk puts on a great one with many healthy options (bean salad, grilled salmon, jerked chicken, skirt steak at the carving station, and my favorite, the soft taco station. It was fun people watching. There were families, couples, groups of conference attendees, and girlfriends seated together. There were a few available tables, but it was pretty crowded. 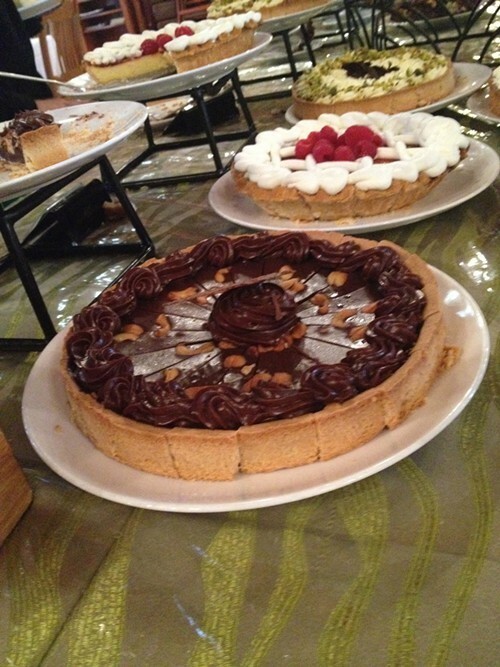 There were many tempting cakes and pies at the dessert table. I really enjoyed the chocolate dulce de leche cashew cake and the lemon poppy cupcakes. I left with a very satisfied belly, and relaxed back and shoulders. The 145 year old Victorian Castle resort has retained its beauty and charm. 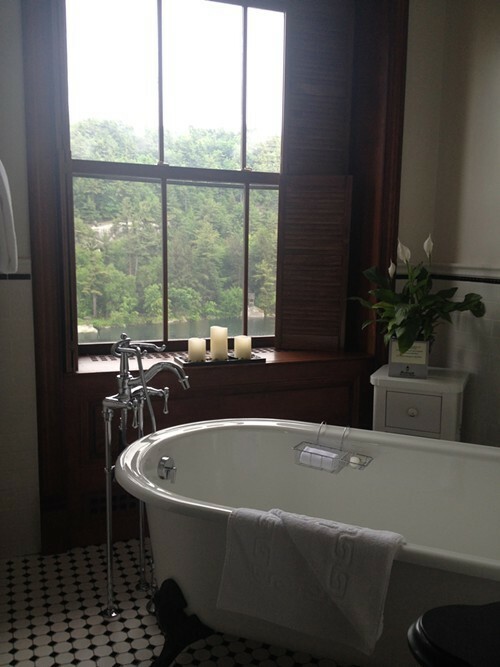 Thank you Mohonk Mountain House! I will definitely be back. Since 2009 Vanessa Ahern has been covering all the good stuff in the Hudson Valley in her blog, Hudson Valley Good Stuff. You can follow Hudson Valley Good Stuff, on Facebook, on Twitter & Instagram.